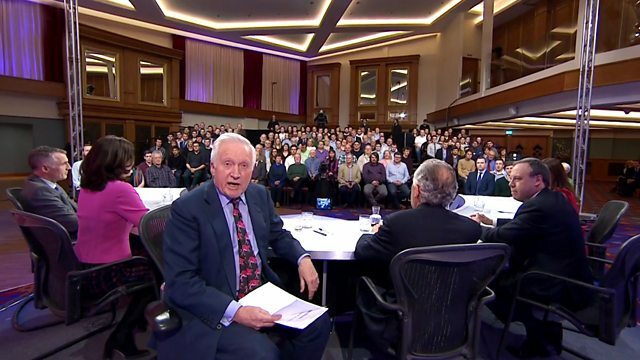 David Dimbleby presents topical debate from Belfast. On the panel are Theresa Villiers MP, Peter Hain, Nigel Dodds MP, Declan Kearney and Grainne Maguire. On the panel are Conservative Northern Ireland secretary of state Theresa Villiers MP, Labour's former cabinet minister Peter Hain, deputy leader of the Democratic Unionist Party Nigel Dodds MP, Sinn Fein national chairman Declan Kearney and the comedian and writer Grainne Maguire.